It's January 6th, 1908, Houdini is starting a run at the Columbia Theatre in St. Louis. He is doing his Handcuff Escape Act and the receipts are no longer what they once were. With so many imitators and rip-off artists out there, audiences had grown tired of seeing this kind of act. Even though Houdini was the one who made it famous, now he was facing a crossroad in his career. The manager of the theatre called Houdini into his office and basically gave him a thrashing about the low attendance. I believe he said something like "your act is not worth a plug nickel, or even a normal nickel" (not sure what a plug nickel is, lol). That is what Houdini was faced with in January 1908. So what does he do? He brings out what he calls at the time "the best thing he has ever invented." That invention was 'The Galvanized Iron Can Filled with Water'. The newspaper ads promoting the escape referred to it as The Galvanized Iron Can Filled with Water and clearly Houdini referred to it as that. It wasn't until April 1908 that a newspaper referred to the can as 'looking like a giant Milk Can'. The debut of the Milk Can Escape took place at the Columbia Theatre in St. Louis, January 27th, 1908, (exactly 103 years ago today!) After theatre manager Tate told Houdini his act was worthless, Houdini came back with the Milk Can. The opening night of this performance all the area press was invited to witness Houdini's latest invention. However, not one single person from the press showed up. This was a pivotal moment in Houdini's career and no one was there to record it. We do know the "Failure Means a Drowning Death" concept was a huge hit for Houdini as he continued to use the Milk Can Escape as his closer until 1912. 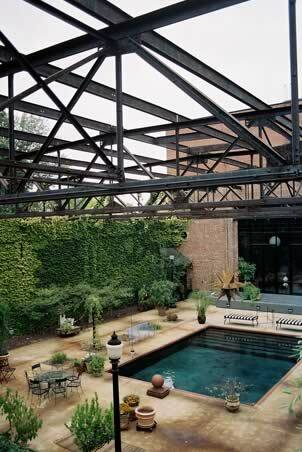 In 1912 he would present for the first time another new invention combining elements of his water escapes and upside down outdoor escapes, the Water Torture Cell. 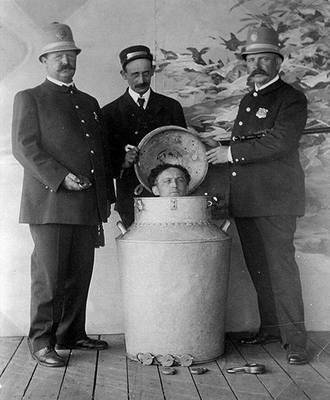 Though the Water Torture Cell was more spectacular, Houdini did continue to perform the Milk Can escape in a different capacity. On occasion Houdini would use his Milk Can with a challenge. He would allow challengers to fill the can with something other than water. A dairy filled it with milk and he escaped. But it was in England in 1911 that Houdini had trouble. He allowed the Tetley Brewery to fill the can with beer. He was overcome by the fumes from the alcohol and passed out and had to be unlocked and removed from the can. However in Columbus Ohio of the same year, he did the same stunt, can filled with beer and placed inside a wooden container (see The Double Fold Death Defying Mystery above) and escaped with no problem. On April 18, 1916 Houdini was at Keith's Theatre in Washington D.C. The challenge came from the employees of Abner and Drurys Brewery. In the article they refer to the device as a large cask, but the description clearly the Milk Can. Houdini escaped in two minutes. The Washington Times article finishes with this line "In exactly two minutes he was out of the cabinet, wasting a lot of good beer that dripped from his body." So while the Water Torture Cell took over as the closer, the Milk Can moved into the spot of 'challenge' escape. 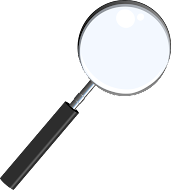 Perhaps, he referred to the device as different things depending upon what was inside. Milk inside it was the Milk Can Escape, water inside it was the Galvanized Iron Can with Water, beer inside it was a large Iron Cask Escape. I just found out through Pat Culliton's book HOUDINI-The KEY, Houdini didn't invent it, a guy named Montraville Wood did. This fact was also pointed out in the Kalush Biography as well. Wood pitched the idea to Houdini and they apparently discussed it for a while in letters. Mr. Wood eventually developed eight different ways to escape from the Milk Can. I wonder what they were? Actually, they are listed in a patent Houdini applied for in Sept 1908. 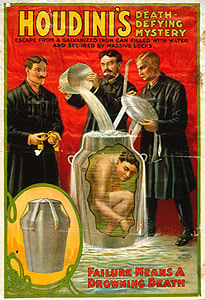 Interestingly, none of Houdini's Milk Cans featured the straps that are prominent in the poster. However, a method of using straps was one that was listed in the 1908 patent. Who was Montraville Wood? 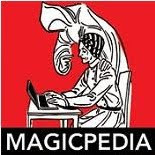 He was an inventor, scientist, lecturer and magic enthusiast. He was an associate of Thomas Edison and was the district engineer for the Edison Company on the Pacific Coast. He was also the Aeriel Postmaster for Chicago. During his lectures he would demonstrate how gyroscopes could be used in airplanes and monorail cars. He begins with offering an audience member a chance to wrestle the gyroscope. If you recall your magic history, P.T. Selbit had a routine he called "The Mighty Cheese" which was essentially a hidden gyroscope that could not be pushed over, no matter how hard you tried. This demonstration was part of Wood's talk on the gryoscope. He also gave a demonstration of ultra-violet rays and explained the different ways it could be used, including the treatment of diseases. Wood's association with Edison is interesting, in fact he very much resembles Thomas Edison. Among his nearly 100 inventions, was the two-button electric switch. This was the common household electric switch prior to the more modern lever switch that we are familiar with today. Among Wood's contributions to magic were a mechanical card rise, a Spirit Hand and Skull, Houdini's Iron Box Escape and the Milk Can Escape. How many Milk Can's there were is anyone's guess. I have discovered several different versions online. I'm only posting links to cans that I believe were used by Houdini. I know other manufacturers produced the Milk Can escape after Houdini and those I won't include. Milk Churn: The Milk Churn was a Challenge that Houdini faced several times. It may have been the inspiration for the Milk Can. Smaller Milk Can: I had seen this once in an eBay Auction. It appears to maybe be a prototype. By the way, on the link you'll need to scroll down a bit to find the image of the Milk Can among all the Titanic memorabilia. Copperfield Milk Can: This Milk Can came from the Sidney Radner Auction. It has the identical shape to the can seen in pictures with Houdini but is missing the upper handles. I believe this was on display at the Houdini Exhibit in Appleton Wisconsin at one time. 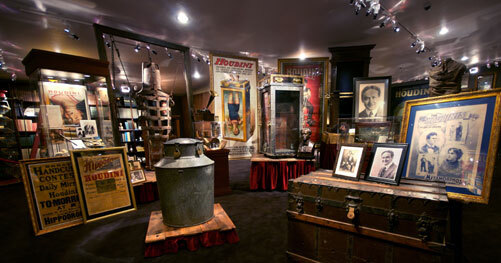 The Lund Milk Can: This is the can that is on display at the American Museum of Magic. It's also the can that was on display during the MAGIC! Science and Wonder exhibit in Houston Texas and is currently on display at the Houdini Art and Magic Exhibit in NYC. The Lund Milk Can+: This photo shows not only the Milk Can but also the traveling case. The brass buckets were for water. The Bell Milk Can: This is shown on page 448 of HOUDINI-The Key by Patrick Culliton. 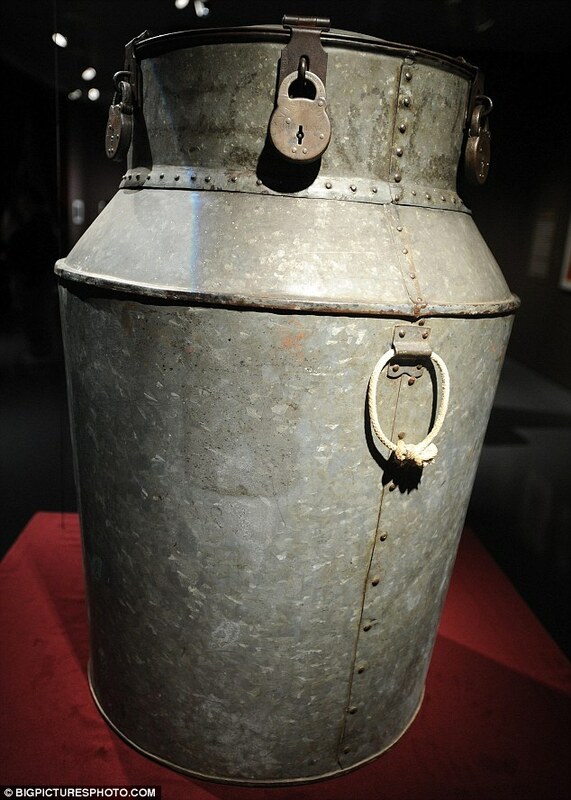 This Milk Can is owned by collector Randall Bell and was originally found in the basement of Houdini's home on 278 West 113 th. St. This can is unusual because of the length of the shoulder/sloped part of the can. It's twice as long as every other can and may be the same can as the 'Smaller Milk Can' that I have listed though I'm not 100% sure. They both have a similar slop to the shoulders. The Double-Fold Death Defying Mystery: Apparently escaping from a water filled can wasn't good enough for audiences. Actually, by Spring of 1913, Houdini knew he had to improve the Milk Can because it was already being copied by others. So he added a wooden crate that the Milk Can would go into. The can with Houdini inside would be sealed and then the lid of the crate would go on and be locked as well. Houdini featured this at Hammerstein's Victoria in NY for only two weeks. I get the impression that he this only on special occasions or with challenges. Hardeen would later feature this effect in his show. Where is this crate today? HOUDINI Milk Can: Of course all of these cans were Houdini's. But the photos with Houdini and the Milk Can show a slightly different can than those above. The difference can be seen in the position of the handles. The handles are on the angled/shoulder part just below the neck of the can and they are in the same position as a traditional real milk can. I'm not sure where this can is today. I think there might be more Houdini Milk Cans out there. I remember hearing about a can being sold at auction maybe 10 or 15 years ago and I don't think that is one of the cans I have listed. It's anyone's guess how many of these there are total. There is one other can that makes me wonder if it isn't a Houdini original and that is The Amazing Randi's Milk Can. This can was used on the Houdini Special in which Dean Gunnarson filled in for Randi. It's certainly the spitting image of the Lund and Copperfield Can, but it too is missing the handles on the shoulder. It could simply be a very good copy. This is not the same can that Randi supplied on the TV Show Happy Days however, again, the handles are the give-away. The majority of copied Milk Cans are easy to point out because of the shape or size being different than the Houdini can. For some reason this seems to be the one Houdini effect that gets exposed online and in books and even in movies. But only one method is ever exposed and Houdini had eight different methods, which could mean that there are eight different cans, or MORE! Houdini even had plans of being put into the can and having the can turned over and placed into another can or box. This would certainly mean the exposed method would not work. The Columbia Theatre in St. Louis was located at 421 N. 6th Street. I previously was led to believe that the Columbia Theatre was at a different location. It appears the previous theatre wasn't built until 1926. The old Columbia where Houdini performed was built prior to 1899 and was torn down in 1925. Today there is an office building and mall on the location of one of Houdini's most historic events. 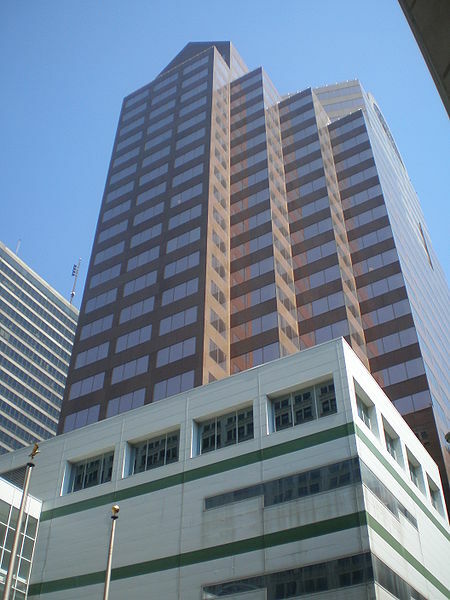 It's called One City Centre. I spent hours trying to locate a photo of the old Columbia but so far nothing. Update: There may be yet another Milk Can out there because from 1906-1909, Leonard Hicks, with Houdini's training and permission presented Houdini's act in America, complete with Milk Can Escape. No idea where that can is today. UPDATE 2: The Double-Fold Death Defying Mystery has been located. It was in a private collection all these many years. It is available to bid on in the upcoming Potter & Potter Houdini Auction on Aug 23rd, 1914. UPDATE 3: There is ANOTHER authentic Houdini Milk Can out there. I've seen a photo of it, and trust me it's the real deal. And that is all I can say, as I am sworn to secrecy. Great overview! I hadn't seen some of this material. Superb work! I have a feeling I'll be coming back to this article for research again and again. Love that you nailed down all the existing cans. The Milk Churn...now that makes sense. Yeah, I've also always wondered what happened to the can with handles. Shame that doesn't exist as it's the only can we've seen with Houdini. I sometimes wonder if the Lund can isn't the can Hardeen said he had made in 1928. I know nobody wants to consider this as that's become such an established "Houdini Can." But it certainly looks to be the can Dash is using in later photos. Actually, I wonder if the Copperfield can is the same can as the one with the handles. Maybe HH took off the handles for some reason? The can w the upper handles seems to be missing. The box for the Double fold death defying mystery is missing. Here is something I forgot to add, there is another can out there that's not been seen. 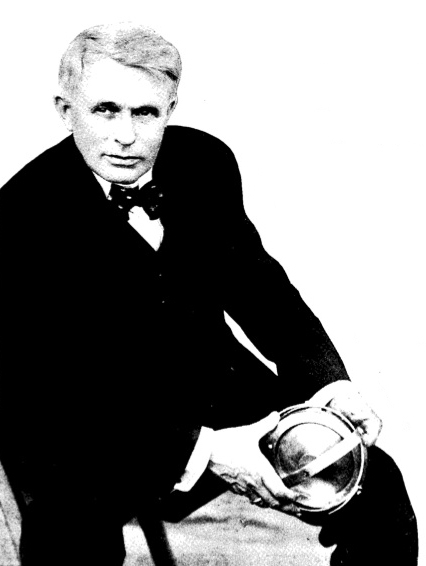 In august of 1908 the great Leonard, a protege of houdinis began doing the milk can when Houdini went to Europe. Houdini was working w him so I'm sure he had a Houdini Milk Can. Maybe even the one w handles. The Great Leonard? Interesting. Not sure I've ever heard to him. Maybe a new case for the Magic Detective?